NUS chemists have developed a more effective method using heavy water splitting to swap hydrogen atoms on organic molecules with their heavier cousins (deuterium) for pharmaceutical applications. By incorporating deuterium (a heavy isotope of hydrogen) in medicinal drug molecules, it can improve their metabolism while retaining therapeutic effects. This has emerged as a viable strategy for the development of more effective drugs for the pharmaceutical industry. In this process, selected hydrogen atoms in the drug molecules are exchanged with deuterium atoms in a process known as deuteration. The resulting carbon-deuterium (C-D) bonds which are stronger (more inert) than the carbon-hydrogen (C-H) bonds change the absorption, distribution, and toxicological properties of the drugs. This is typically carried out using the hydrogen/ deuterium (H/D) exchange process. The process involves high temperatures, acidic/ alkaline reagents and/ or noble metal catalysts, and is carried out over multiple cycles. However, such processing conditions may cause drug molecules to degrade and many unwanted side reactions may occur due to the presence of the various molecular functional groups. A team led by Prof LOH Kian Ping, from the Department of Chemistry, NUS in collaboration with Shenzhen University has developed a method which can selectively control the deuteration of organic molecules (which can be used for medicinal drugs) and operate under mild reaction conditions. This is achieved by using a II-VI semiconductor as catalyst to photochemically spilt heavy water (D2O). D2O is made up of the hydrogen isotope deuterium and is used as a source of deuterium atoms in this method. 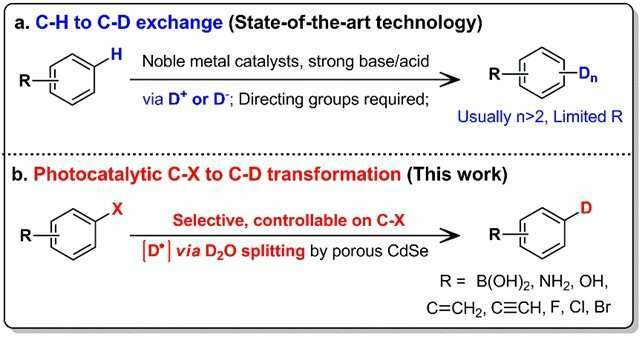 Unlike conventional approaches which substitute the hydrogen atom at the C-H bonds, this method utilises the more reactive carbon-halogen (C-X) bonds present in the organic molecules to form the C-D bonds. In this new method, the amount of deuterium atoms and their substitution location solely depend on the C-X bonds available in the molecule. It also allows deuterium to be incorporated in a step-by-step manner for sensitive biomolecules. Mr CHEN Zhongxin, a Ph.D. student working on this project, said, "Ultrathin two-dimensional nanosheets made from a II-VI semiconductor are subjected to an acid pretreatment to "open" their nanopores so that they become more porous. This increases their photocatalytic activity up to four times when used to split the heavy water." "The use of heavy water as the deuterium source is ideal because it is non-combustible, relatively low in cost and easy to handle. This new concept of deuteration using heavy water splitting can potentially be applied to many other catalytic reactions to develop complex deuterated drugs and advanced materials," added Prof Loh. This research work was highlighted by a perspective article in Angewandte Chemie International Edition to explain its deeper implications and significance to the chemistry community.